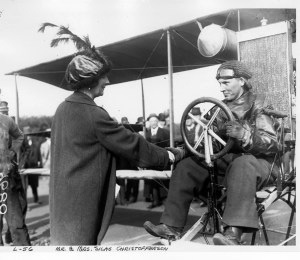 Silas Cristofferson at Bishop before the record flight attempt. Here in the record-setting Antelope Valley, we’ve become accustomed to the aviation milestones achieved in the skies above us, with major and minor records stacking up on almost a daily basis. Over the years, public knowledge of these events has run the gamut, from military aircraft testing conducted in secret, to widespread newsprint and television coverage and a chance to gain some national pride. It wasn’t always that way. Long before Muroc or Edwards ever saw an airplane on a regular basis, the record-breaking business of aviation was seen less as technology and more like the circus coming to town. Back in 1914, aviation didn’t belong to the military and commercial aviation industry. It was made up more of adventurers who, a few years prior, were more apt to be building bicycles or enjoying early day autos. Flying was still getting the feel of its newly-found wings and a bunch of early young adventurers had no problem looking for challenges to catch the attention of the non-flying public with acts of daring. They challenged the unknown in planes that were more like kites than aircraft. Silas Cristofferson was one of those young, daring West Coast aviators who had no problem staring down the unknown and putting himself in danger, while exploring the possibilities and capabilities of the aircraft of the day. When the Inyo Motor Club wanted to seek funding from the government for a roadway to run up the Owens Valley and connect it to the rest of the country, a stunt was thought up that would achieve the wanted publicity for the sponsoring organization. 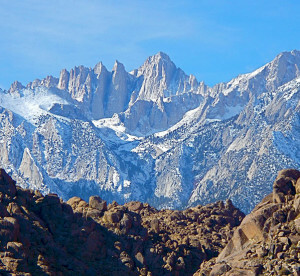 A plan was put forward to attempt an aviation flight that would achieve an American altitude record over Mount Whitney near Lone Pine. 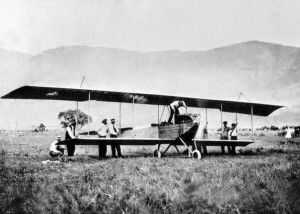 The call was put out and San Francisco-based Cristofferson answered the challenge and put into motion the assembly of an aircraft to attempt the flight. Silas drew up the plans for the aircraft that would be known as the Whitney plane and sent them back to the Curtiss Aircraft Works. 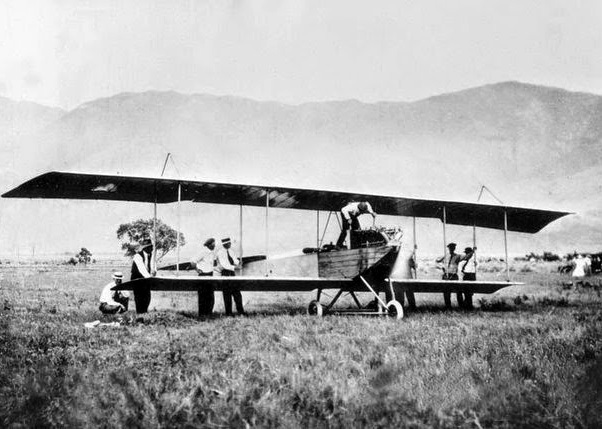 For $7,000, the plane was constructed and shipped to California to make the attempt at the record. 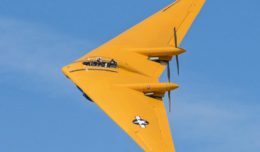 On June 20, the plane arrived and was assembled at the Bishop driving field and the kick off of the Owens Valley aviation festival got underway, with the hope of ending the event with the record flight over the Whitney summit. After much fanfare, the aviator took to the task of fine-tuning his craft and getting it ready. On the 22nd Silas and an observer took off from Bishop and made their way south to the town of Independence, where the then-unknown force we now call the Sierra Wave almost brought a quick end to the attempt, when severe wind currents tossed his plane around in a way that had the young aviator rethinking his strategy. Over the next couple days, several attempts were made but all failed to achieve the desired results, with high winds and mechanical issues plaguing the young aviator and his craft. Finally a favorable weather window with low winds materialized, but even then the plane could only reach an altitude of 13,400 feet. Silas made a beeline back down to Lone Pine, sent a car to Bishop to pick up a different propeller, and then removed all the camera equipment and unnecessary weight. With all these changes — and a little luck — he hoped for the boost in performance he needed to reach the peak. As morning broke June 25, the winds were calm and the now-restless organizers and public were hoping for headlines to be made. This time Silas flew down towards Owens dry lake, turned and made the slow climb up to the peak of Mount Whitney and finally, much to the joy of all the observers with telescopes and binoculars, reached an altitude of 15,728 feet and circled the peak of Mount Whitney. Sadly the event was not able to make it to a film reel, as the plane had shed the extra weight of its movie camera and the movie equipment that was being delivered to the summit never made it, as the mule that was packing the equipment slipped and lost the equipment off its back! After the record was set, Silas again made a quick descent to the valley floor. With tears of joy the young aviator, still frozen and shaking from the cold, was raised on the shoulders of all those in attendance and carried about the field, ending with him being delivered to his wife, Edna, who greeted him with hugs and kisses. Silas Cristofferson and his wife, Edna, early in his aviation career. The glory of holding the altitude record back in those days was always short-lived, there being no shortage of young, daring types looking to best another pilot’s skill in airmanship. Christofferson died not long after he set this record, while testing a new aircraft design. Sadly, he is just a footnote in American aviation history. He achieved a few other noteworthy firsts, including the first flight from the Bay Area down the Central Valley over the Tehachapi’s, ending up in Los Angeles, and operating one of the very first aviation passenger services in the country in San Francisco. Christofferson’s very first claim to fame was a flight off the roof of the Hotel Multnomah building in Portland, Ore. Next time you’re driving on the 395 and passing through Lone Pine, look to the west and think of the day when a young twenty-something traded a flight off a building for a pass over the highest peak in the lower 48 states, helping a motor club get the recognition it needed to help construct what would become known as US Route 6! Until next time, Blue Skies and for now, Bob is out!